And although it’s a really good book, it’s just not as good as it should have been with such a winning concept. And the simple reason it fails is because the damn thing is just too short. It needed to be at least twice the length it is to really work; to revel in the idea of a ship that is a mile long and half a mile wide. The scale of the ship is immense; the scale of the story about the ship should be equally impressive. 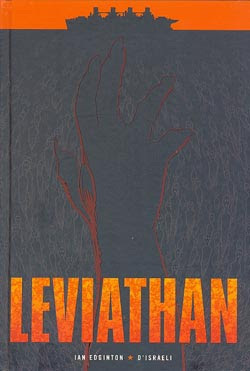 I’d like to think it was limitations put upon the writer and artist by the publisher that made this such a truncated story and, in a perfect world we’d be looking forward to a director’s cut of the work coming out soon, but sadly, Leviathan will only ever be the book in front of me now, half the book it should have been. 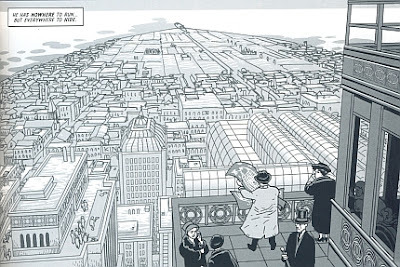 The presentation itself is particularly well done, it looks and feels like proper Bande Dessinée, hardback, oversized and with an exquisite cover promises mystery and diabolical goings-on at sea. Disraeli’s art makes great use of the larger page size, perfectly realising the epic sense of scale and grandeur that a ship of such scale conveys, yet also perfectly capturing the sense of desperation and seediness found deeper down inside the ship. Leviathan starts with a great few pages detailing the mammoth scale of the project to build such an incredible vessel; sixty million pounds, constructed in sections, twenty eight thousand passengers and crew, parks, ballrooms, cinemas and even a zoo are onboard. 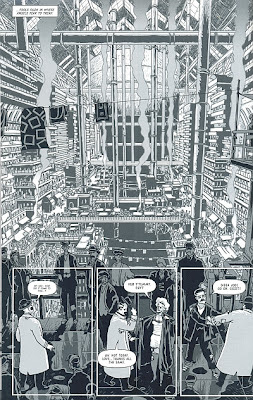 And D’Israeli gives us a double page spread that instantly manages to turn these facts and figures into reality for us with a tremendous visual of the huge ship. But instead of taking it slowly from here, giving us a detailed look at the ship and the society onboard, the story instantly shifts to the murder mystery that will speed the book along to its conclusion. Leviathan went missing in 1928. It is now two decades later and the ship still sails on, through a sky with no sun or stars. No-one knows where they are but many of the passengers fear they are in limbo or Hell. And the ship carries on, never ending, with no hope of reaching port. On board, life is as you may expect from a 1920s British ocean liner. First, Second and Steerage passengers adhere strictly to the traditional divides of social class of the time. Whilst first class has spent twenty years behaving as gentlemen and ladies whilst slowly eating their way through the exotic menu provided by their onboard zoo, Steerage has become a lawless desperate place, a wild west below decks kept there by the stewards above decks. Lament then works simply and methodically, quickly peeling back layers of intrigue and mystery until he finds himself in the engine room and the secret that lies not only behind the Leviathan’s creation, but is also the reason for it’s twenty years of travelling these hellish waters. And whilst the book’s ending is good, it’s certainly not as good as it should have been. I wanted this book to be so much more than it is, in every sense. I wanted to revel in the grandeur of this ship as big as a city, I wanted to be taken through some of the more bizarre areas of the ship, be told a few tales of it’s past and finally, when the murder mystery kicked in, I would have preferred it to be a deliciously slow boil mystery, taking Lament all across this hellish ship. What there is in Leviathan is wonderful, a great concept, stylishly and intelligently realised. But there’s just not enough of it and I finished this great book feeling terribly unsatisfied. A real shame. It should have been fantastic. Originally posted for PROPAGANDA at the FPI weblog here.